Photograph of tequila bottle and decorative box. Jose Cuervo Reserva de la Familia Tequila 1996 Collection in a box with artwork by Mexican artist Manuel Velázquez. 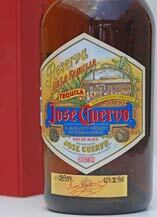 Bottle Number: 08959 - Date: 07-V-96 (07 May 1996). Mexican plastic arts, as much as its tequila are a big part of our national identity, of who we are. 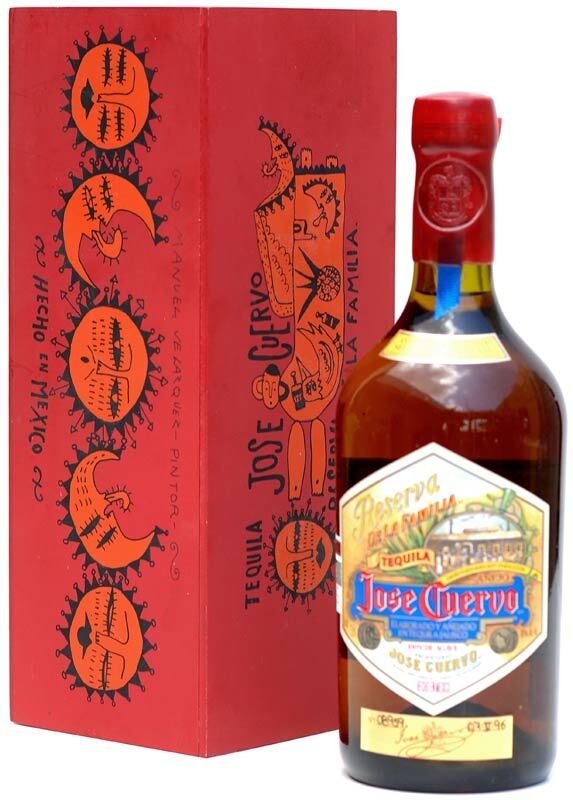 In Casa Cuervo we look forward to supporting the youthful art of our country. That is why every year our Tequila Reserva de la Familia boxes include an original printed design from a Mexican artist; a unique and collectable piece, just like the annual production of this Tequila. This year our boxes have printed on them works from Manuel Velázquez, an artist who was born in Tuxtla Gutiérrez ub 1968. A student of the Plastic Arts School in Chiapas since he was 12 years old, currently he is a teacher at the Veracruz University. His work has been exhibited individually as well as on Collective Expositions in Mexico City and the United States. He has obtained several recognitions such as: Honorable Mention in the "Maximo Prado" contest, the "Young Creators" scholarship as University Merit acknowledgement given by the State of Veracruz. The images presented on this box belong to the 1996 production of Tequila Reserva de la Familia and were painted in a mixed technique over raw cotton paper to afterwards by printed on serigraphy.